I have a feeling that this is going on as I write, but, I’ve just spotted the hashtag #HugaPanda and it seems to be that there are 108 Pandas doing Tai Chi in Trafalgar Square. Can any locals confirm? This is no doubt a follow-up from the Chengdu Association for Cultural Exchange’s last advertising triumph – turning capital cities black cabs into Pandas (well, painting white patches on them and cartoon pandas) and is part of Panda Awareness Week. 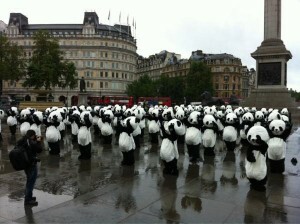 Chengdu in Szechuan Province, China is home to 80% of the worlds panda Population. Sneaking suspicion that Ogilvy are the agency behind this stunt.